M-I-C-K-E-Y M-O-U-S-E. Mickey Mouse! 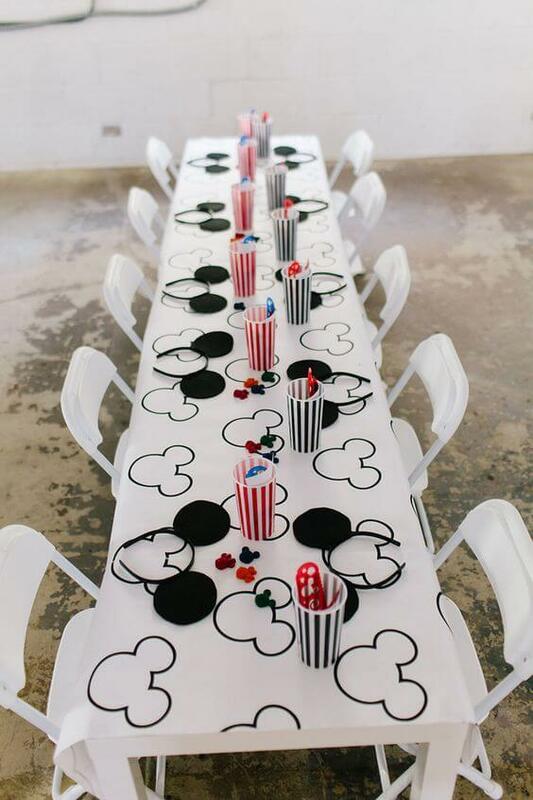 If you want to plan a magical Mickey Mouse birthday party, you’ve come to the right place! Here are 29 ideas to get you started. There are ideas for party supplies, cakes, cupcakes, decorations items like pillows, favor bags and boxes, garland and plenty of treats. 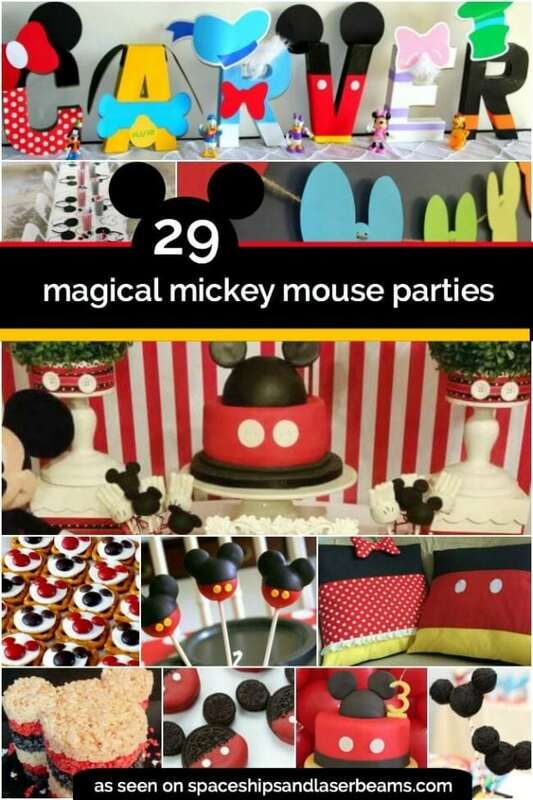 Multiple Mickey Mouse parties may be in your future with so many awesome ideas! A unique twist on a Mickey Mouse birthday party: combining a Mickey Musketeer party. Wait until you see the birthday cake! 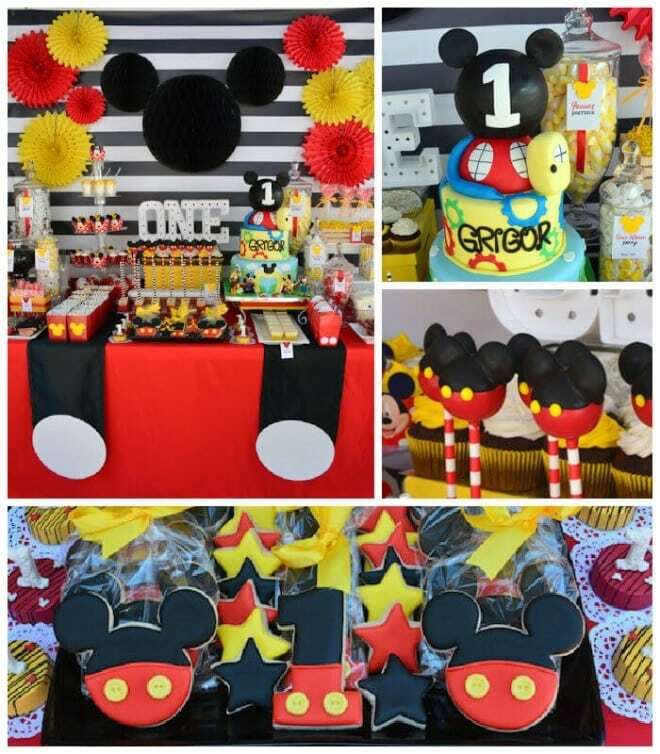 I had less than two days to create this Disney Junior, Mickey Mouse Clubhouse themed celebration. What do you think of the end result? 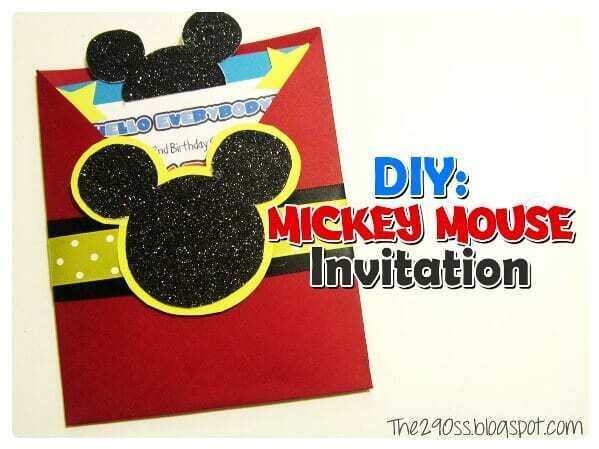 With the help of a printable template and a darling example, you too can DIY Mickey Mouse invitations. All you need is colored cardstock in red, turquoise, yellow, white and black plus a smidgeon of polka dot ribbon and a supply of glue. Creating Mickey Mouse party table centerpieces in a time crunch is totally doable! 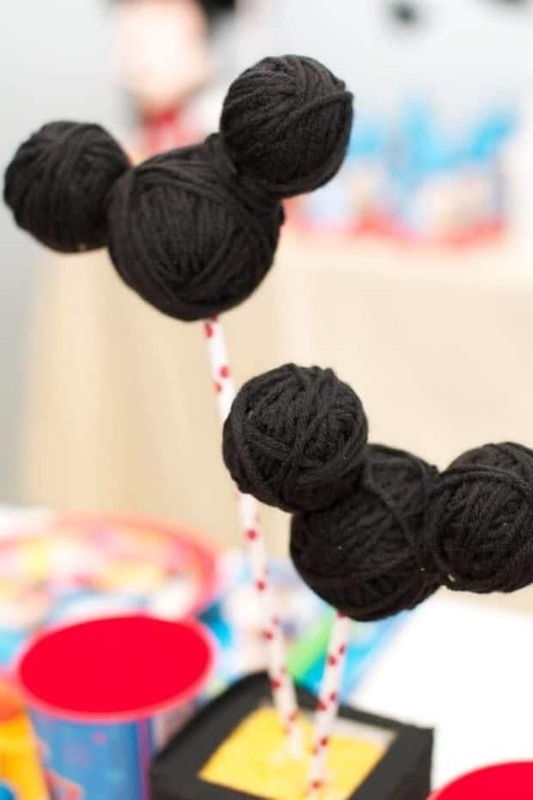 These adorable Mickey head centerpieces are easy to make using two sizes of Styrofoam balls (two little, one slightly larger) and wrapping them in black yarn. The smaller “ears” are attached to the slightly larger “head” using toothpicks. To display this magic Mickey centerpiece, push a straw into the base of the head and insert into a Styrofoam block camouflaged by a vessel like a vase or lantern. Polka dots and plenty of Mickey inspired decorations and treats create one joy-inducing Mickey Mouse birthday dessert table. A Mickey Mouse cake, Mickey Oreos and sweet Mickey cookies will bring all the smiles! You can easily DIY your own Mickey ear “Happy Birthday” banner using paper plates, black construction paper and printed letters. A love of Mickey and the 3 Musketeers collide for one creative celebration! 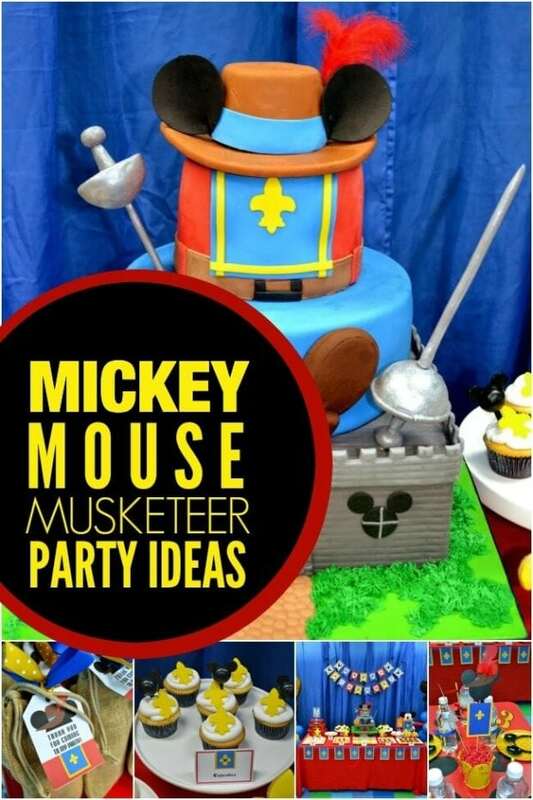 This boy’s Mickey Mouse musketeer birthday party boasts colorful balloon creations, paper pieced Musketeer centerpieces, cute sword, shield and coat of arm inspired décor and dessert embellishments plus an impressive 3 tiered cake featuring a Mickey musketeer! 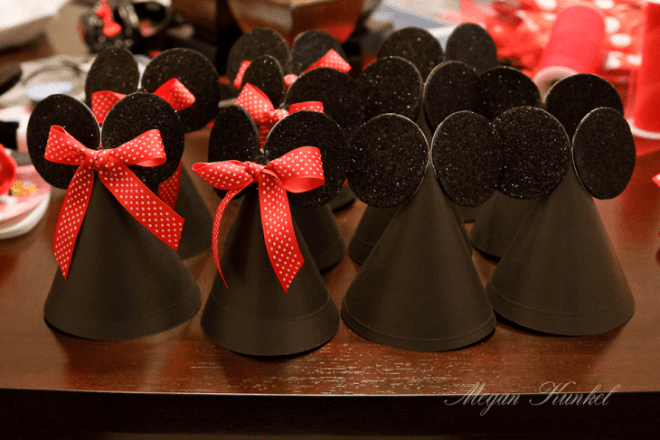 If you want party guests to be “all ears”, craft a bunch of Minnie and Mickey party hats using this simple tutorial. 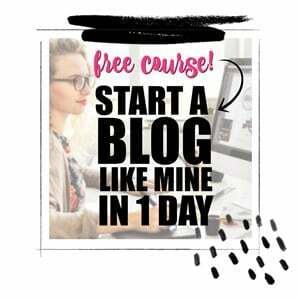 You’ll need to gather enough sheets of black card stock to equal your number of guests, plus black glitter foam, red & white polka dot ribbon, extra ribbon for hat ties and some craft basics like scissors, hot glue gun and hole punch. Assembly is simple and starts with die cutting or hand cutting a bunch of circles! DIY your own Mickey Mouse garland for a Mickey celebration! This tutorial uses tried and true methods of printing out a template, cutting it out and tracing it on colored cardstock until the quantity needed is reached. After cutting out each Mickey, use a paper punch to create holes for stringing with twine or ribbon! The beauty of whipping up a batch of Rice Krispie Treats is that they can be colored and shaped to coordinate with just about any party theme! These Mickey Mouse Rice Krispie Treats only required a Mickey Mouse shaped cookie cutter and food coloring, plus the usual butter, marshmallows and Rice Krispies. Create party decorations sure to be treasured for years to come! 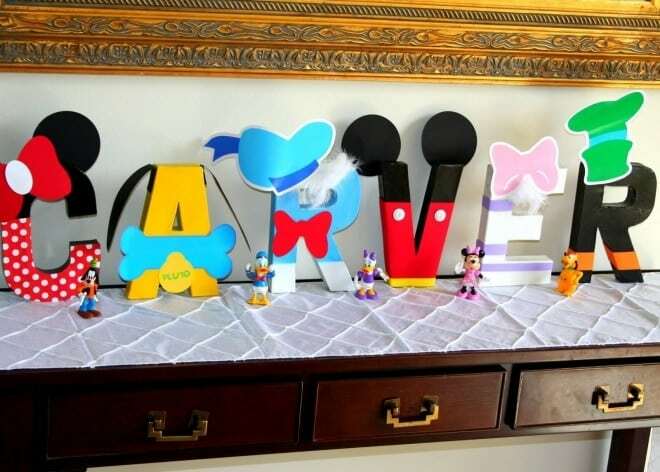 These Mickey Mouse inspired name letters can be used to pay tribute to the guest of honor! Made from 3-D paper mache letters, the simple transformation is made by turning plain letters into a Mickey & friends character. Paint, paper embellishments and printable elements can help accomplish this. 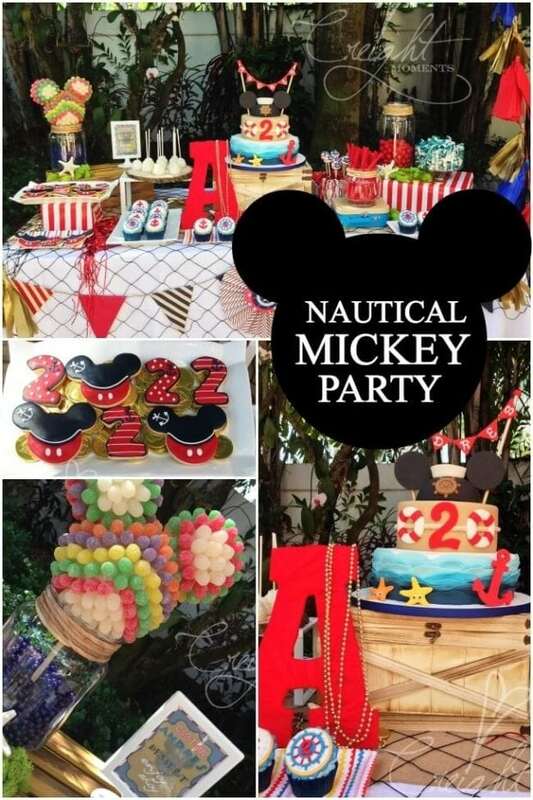 Celebrate your little sailor with a nautical Mickey Mouse Birthday party! Add in treasures of the sea like starfish, faux jewelry, and chocolate gold coins! Don’t forget to mix in nautical stripes and a wide array of nautical inspired desserts. Nautical rope cake pops, fondant topped cupcakes with unbelievable nautical Mickey detail work will impress guests young and old. Four ingredients, including regular and mini-sized M&Ms, are all you need to create these adorable Mickey Mouse Pretzel bites! Would you believe the cook time is less than a minute in the microwave? No oven required! Quick, easy and totally cute! 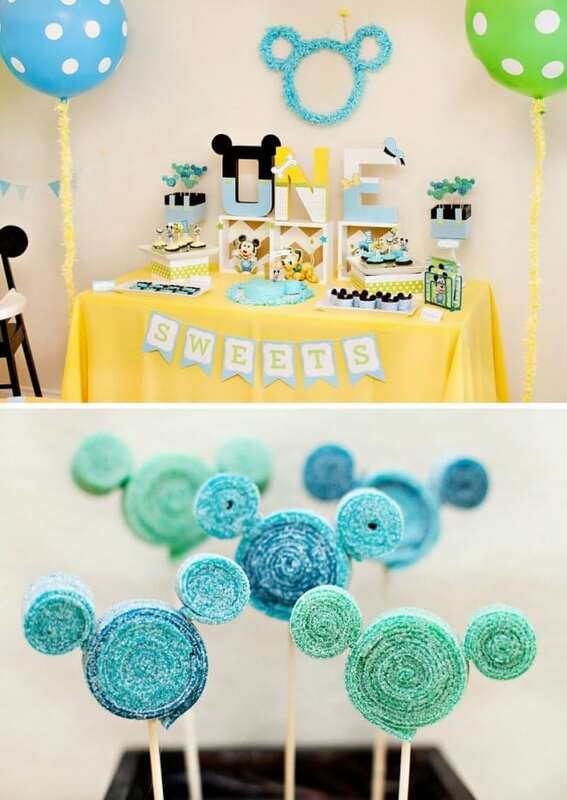 From the Mickey Mouse table suspenders—a fun DIY made from black runners and white felt circles—to a darling black and white striped dessert table backdrop, this Mickey Mouse first birthday is magical! A Mickey and friends cake, Mickey cake pops and cookies and the cutest table centerpieces made from flower pots and foam balls will leave you with plenty of DIY inspiration! 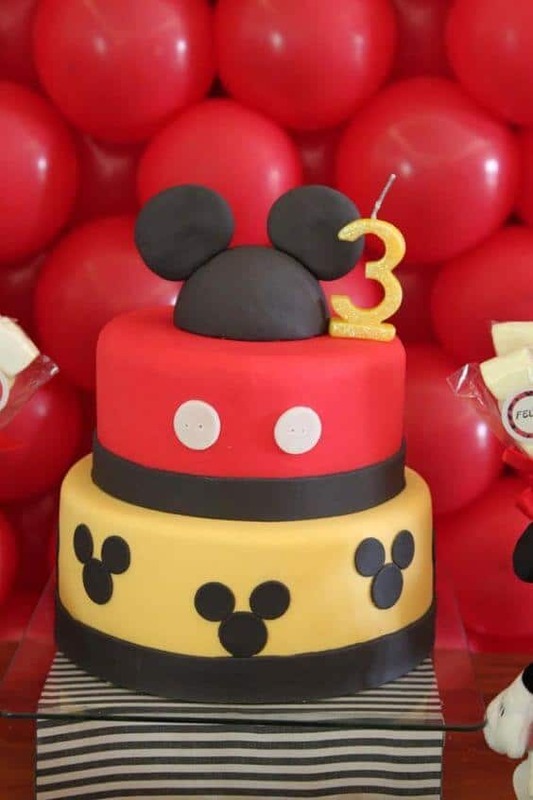 Seeing Mickey Mouse in cake form has to be a magic moment at a Mickey Mouse party. I love the simplicity of this two tiered cake! Red, yellow, black and white fondant gives a fun nod to Mickey which is reinforced with cute white fondant buttons, Mickey heads circling the bottom tier and adorable fondant Mickey ears gracing the top of the cake. 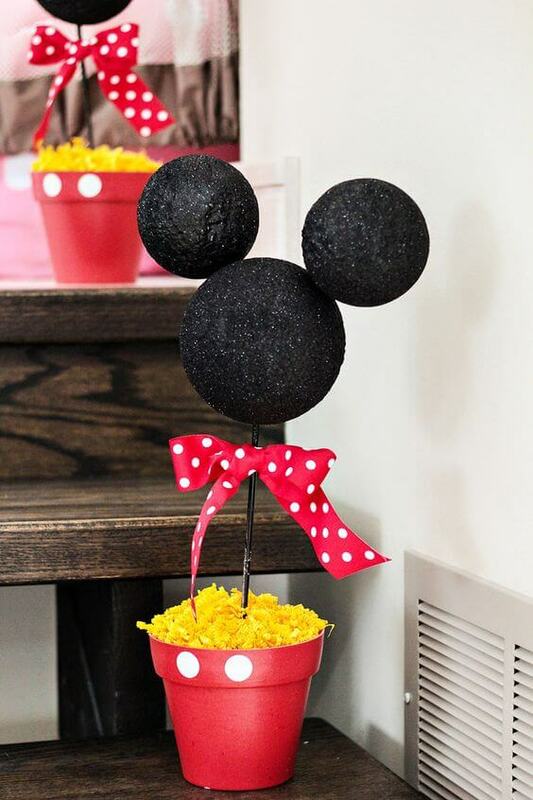 If glitter, glue guns, foam balls, toothpicks and spray paint don’t scare you, crafting up this easy Mickey Mouse centerpiece idea may just be enjoyable. Assembling the Mickey ears to the head with toothpicks and hot glue is quick, as is coating the creation with spray adhesive prior to dusting it with black glitter. Yellow paper shred added to a red bucket makes for a nice base. A thin wood dowel and ribbon addition later, and you’ve got yourself an awesome centerpiece for about $5! 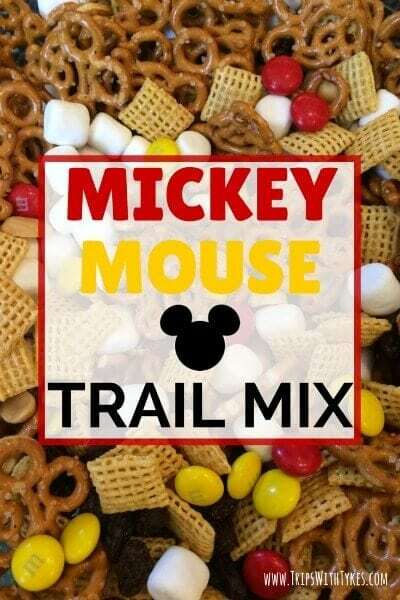 Whether you serve up this Mickey Mouse trail mix as a mid-party snack or package it up for a “happy trails to you” take home treat, it is sure to be a hit! No cooking is involved, just a gathering of some basic trail mix ingredients like pretzels, mini marshmallows, Honey Nut Chex Cereal, peanuts, raisins and red and yellow M&Ms! Mix together and bag up for sharing! Bake a delicious cake with a hidden surprise! 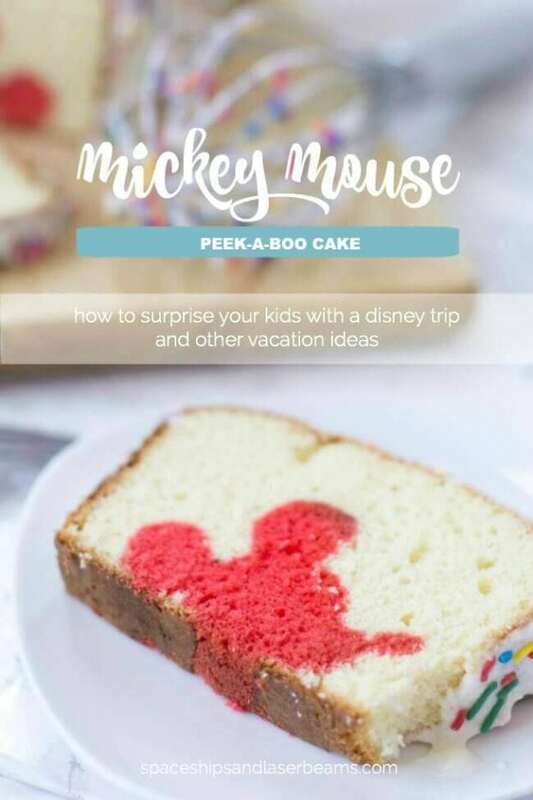 It’s the perfect way to surprise your little ones with a fun trip to Disney or just for a fabulous dessert idea. 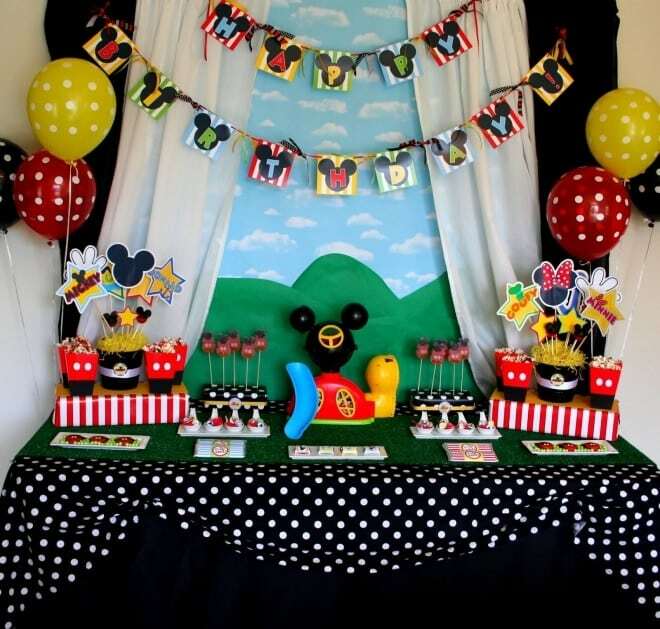 You can raid your child’s toy closet to replicate this Mickey Mouse Clubhouse birthday party dessert table. A favorite Mickey Mouse Clubhouse toy was used for the focal point of this table, instead of a cake! The DIY backdrop was made using butcher paper, curtain panels and a printable party package. Popcorn boxes were dressed up with cardstock, Mickey style! 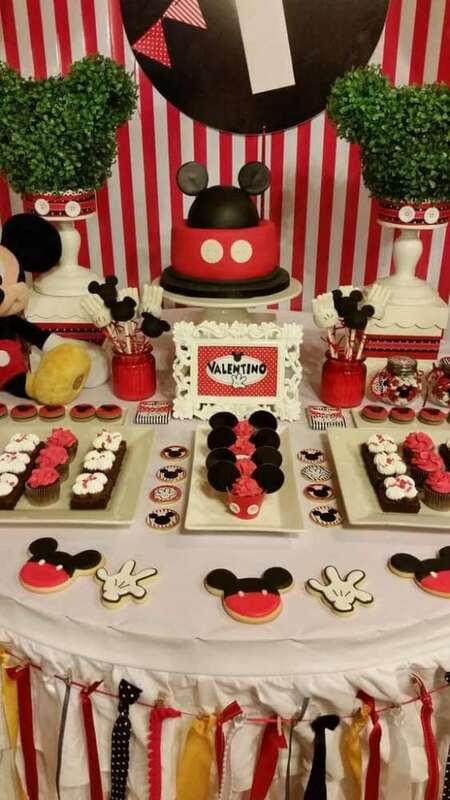 Mickey Mouse shaped boxwood topiaries, a Mickey Mouse cake and the cutest red, white, black and yellow Mickey decorations and treats will have you ready to put together your own Mickey Mouse dessert table. 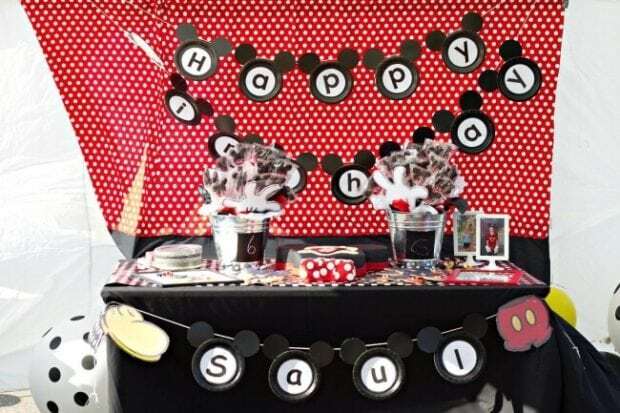 Plus check out that DIY ribbon and fabric garland and the cutest Mickey inspired cupcake wrappers! 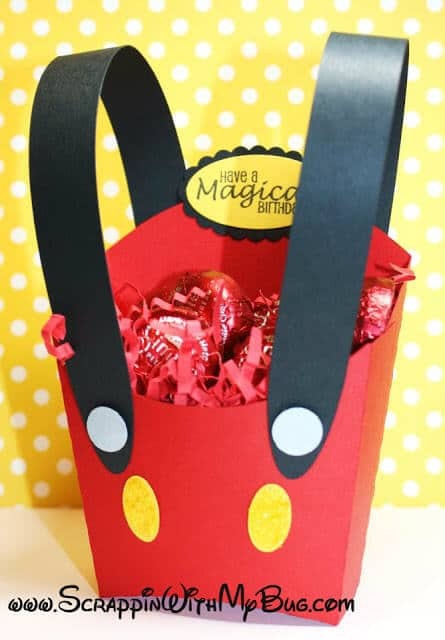 This Mickey Mouse fry box treat container was made using SVG cutting files. However, you could achieve this same look by adding hand-cut cardstock suspenders and paper punched circles and ovals to red store bought fry boxes. 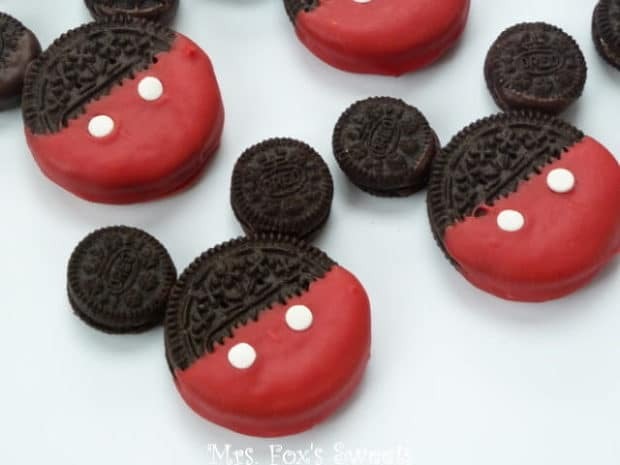 These Mickey Mouse Oreo Cookies look amazing, but don’t require many supplies or much effort. Winning! You will need: regular Oreo sandwich cookies, mini Oreos, red and chocolate candy melts, white sprinkles and waxed paper. The trickiest part is melting the candy melts without overheating them (and resisting the urge to eat every last Mickey Mouse before the party starts)! Simple details often pack the most punch when it comes to throwing an impressive party. 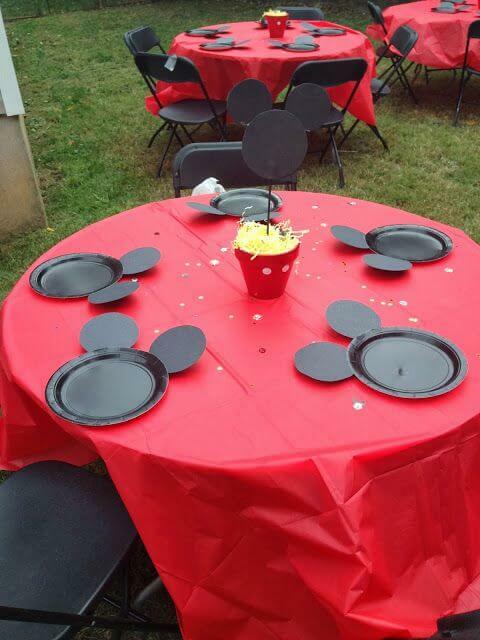 These Mickey Mouse plates are so cute and simple to make! Just hot glue two black cardstock circles to the bottom of a black paper plate to create some extra cute place settings! Simple and modern, this Mickey Mouse birthday party has some cute and easy DIY ideas you can add to your Mickey party idea boards. Desserts were kept to a professional cake and homemade Mickey sugar cookies. I love the Mickey head pom pom garland—a quick DIY glue gun project. The biggest secret behind baking and decorating your own Mickey Mouse cupcake cake is the Wilton Giant Cupcake Pan. Just bake up your favorite cake mix using the pan and get to work decorating with tinted butter cream frosting and white candy melts used for buttons. The trick behind the Mouse ears is molding them out of black modeling chocolate. What do you get when you add glue dots and black cardstock circles to the sides of black paper lanterns? 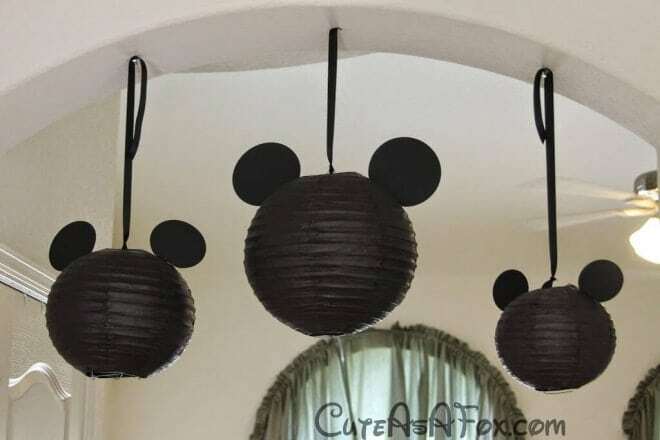 The answer is the most adorable Mickey Mouse lanterns, perfect for hanging up to decorate a Mickey Mouse party! It doesn’t get any easier than this! 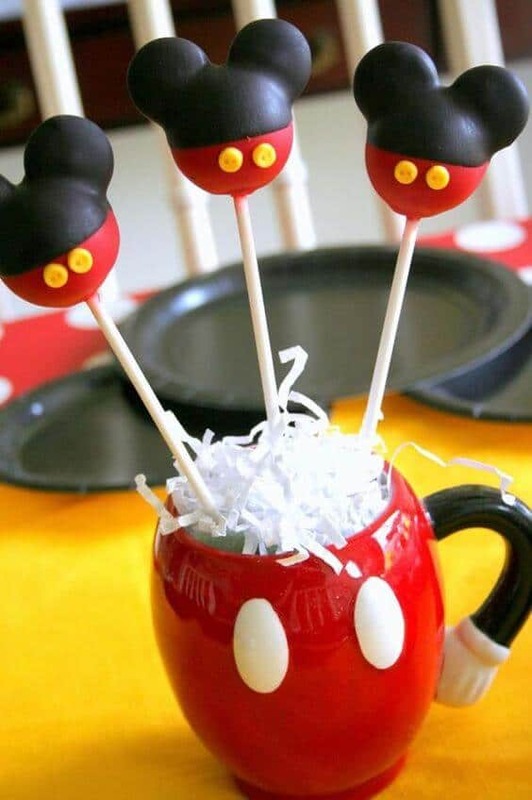 Nearly everyone loves a good cake pop, but a Mickey Mouse shaped cake pop takes the popularity of a cake pop to a whole new level! To achieve that perfect Mickey ear look, use candy melts frosted to a cake ball prior to dipping in more candy melts. Don’t you love how the bottom of these Mickey cake pops were dipped in red to look like Mickey’s pants? And those yellow buttons drive the whole Mickey look home! Healthy options are always a nice offering at birthday parties. Get creative with a Mickey Mouse cookie cutter! Punch out Mickey heads from watermelon, honey dew and cantaloupe. Creatively display the colorful fruity Mickey heads on skewers with other fruit such as pineapple used in between each head as a tasty filler. Voila! 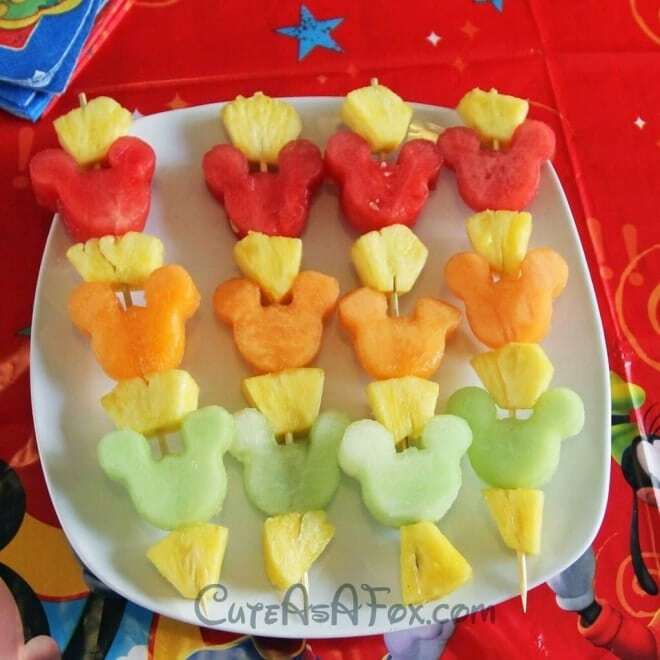 Mickey fruit kabobs made in a jiffy! 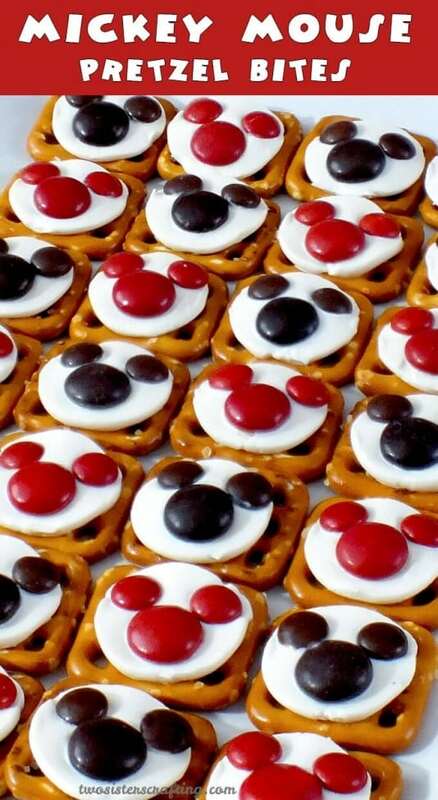 Mickey shaped treats are a cute addition to any Mickey Mouse party. These Mickey Mouse candy kabobs are quick and easy to make using Sour Gummy Belts rolled into tight circles. They are secured with toothpicks and displayed from bamboo skewers. You can whip out a dozen in about 10 minutes! Create Mickey Mouse cupcakes for your next party! 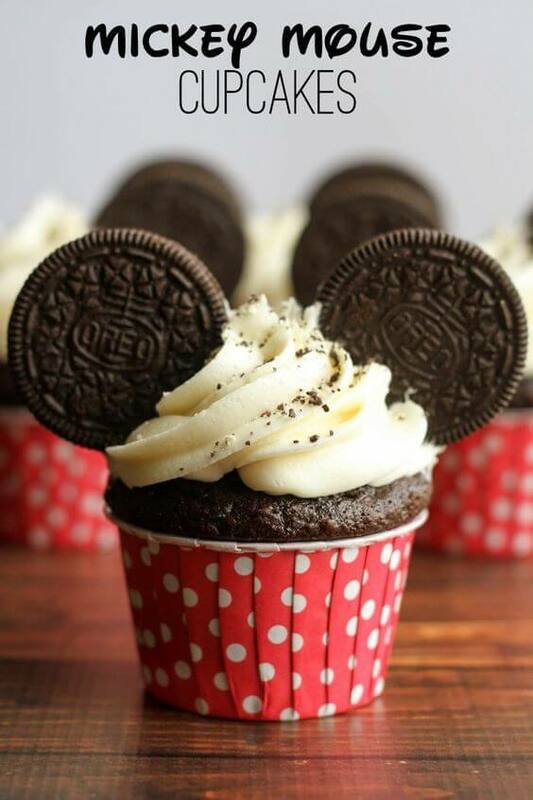 A little swirl of frosting on the top of a cupcake provides the perfect “glue” for attaching Oreo ears! Add a red and white polka dot baking cup, and everyone will be seeing Mickey! 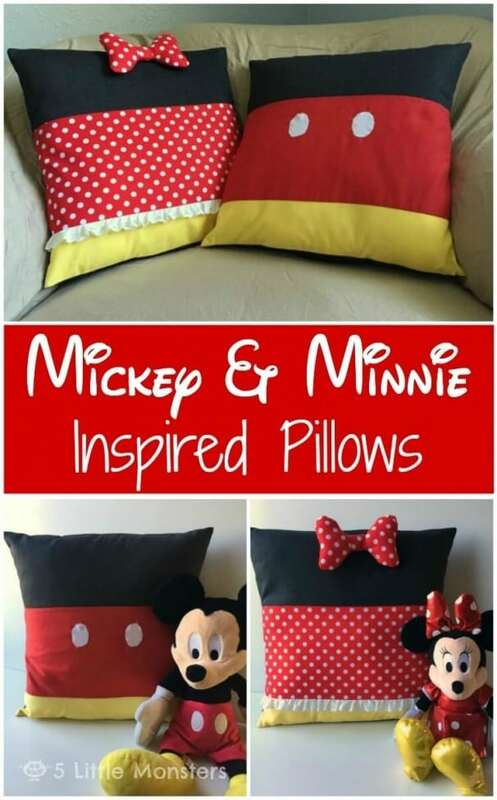 A little creativity, some fabric and sewing notions later and you too can put together Mickey and Minnie inspired pillows! They are perfect for dressing up a Mickey or Minnie party space or gifting as a take-home favor at the end of the celebration. Using fabrics and a pattern reminiscent of their signature outfits the pillows are easily recognizable as Disney’s most famous pair! 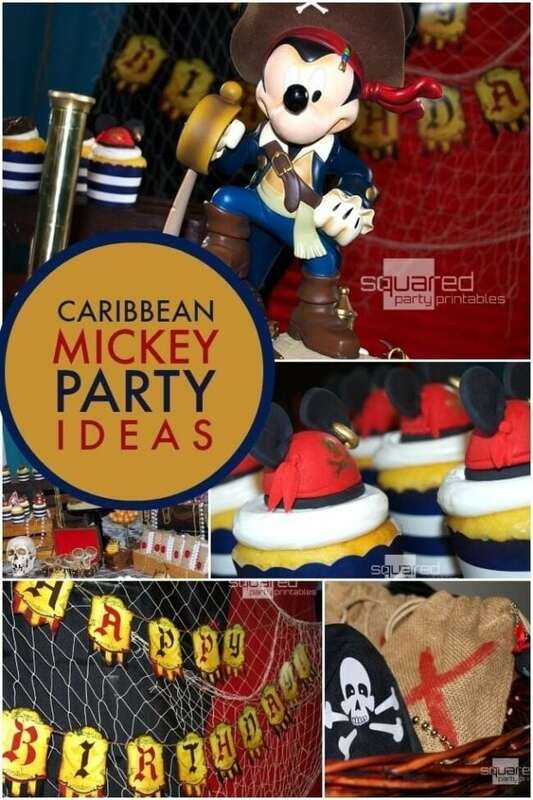 Combining the love of Mickey Mouse and pirates can result in a totally unique Mickey’s Pirates of the Caribbean party. Use or borrow a treasure trove of pirate themed decorations (skulls, fish netting, crates and wood boxes) and get all hands on deck helping you put together a display of pirate inspired treats. Gold gumballs, chocolate coins, chocolate pearls and cupcakes topped with gilded dark chocolate doubloons as toppers. Don’t forget to assemble pirate loot bags filled with a pirate sword, compass and bandana! Check out these adorable Mickey Mouse themed Amazon Affiliate links for party supplies gathered by the Spaceships and Laser Beams crew.